OK time to bring this back again. "Number of vertices of current mesh does not match weight information file." Soooo my points are: *What am I still doing wrong? *How can making a dino be this hard??? *How can saving .wif files possibly be of any use to anybody if this is what happens? I could go and, worst case scenario, assign all the verts myself... But if that's what it takes then we should just remove this wif feature from TPDC altogether. Well, the Segnosaurus should look more similar to the Therizinosaurus than to the Gallimimus... good luck, anyway. Ok, let me explain a few things first. 1) When exporting meshes (ANY mesh) with TresEd to the 3DS format, and exporting it again from 3dsmax to TPM will give you different meshes than when directly exporting it to TPM from TresEd. That happens because 3DS does not preserve mesh data well. For that reason I and Andres created the TPM format. 3DS meshes will create extra vertices and bad vertex normal data, and other stuff may be messed up as well. For what we are doing, 3DS is unrelyable. The only thing you should use 3DS files for, is to match up the dinosaur position and orientation (as explained in the mesh attach trick in my tutorial), nothing else. 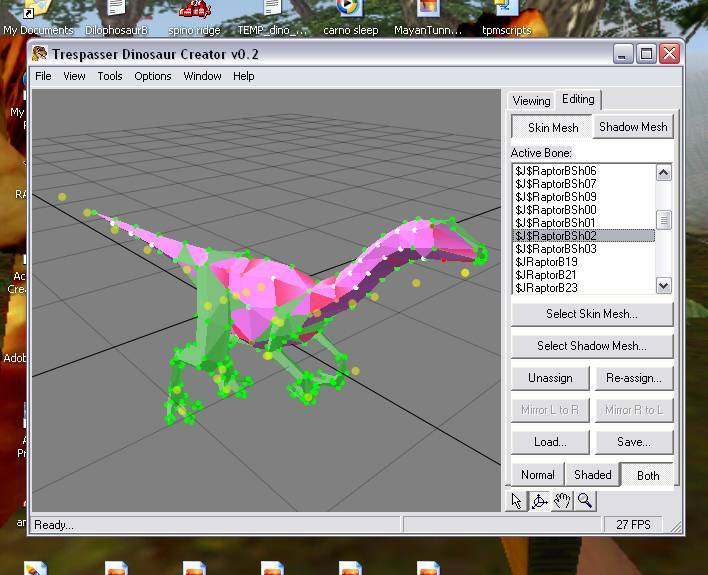 2) The .wif files are mainly meant to save and restore weights from already rigged dinos. The purpose of that is NOT to copy weights from one mesh to totally different one. If the vertex count differs, it will give a warning, and the results will be unrelyable (that is what causes the problems displayed in your second screenshot, the re-exported 3DS mesh is totally different from the one you stored the weights of). When you have modeled a new skin for a dinosaur, and you've gotten it all working in the engine. Now, say there's a bit of warping, and you want to move a vertex a tiny bit. You can't do this in TPDC (it wasn't meant to be a modeling program) so you'll have to re-export the skin from 3dsmax. But hey, if you do that you loose all weights again?! Indeed, and that's when you save the weights of your current version, export the modified mesh again, and load the weights by choosing assign by index. When you've added some faces (and thus) vertices to your new mesh then the geometry data is likely to be totally different, and the number of vertices are no longer the same. In that case TPDC can no longer identify which vertex is which, and thus can't just copy the weights by index (in some cases this may still work, so instead of giving an error message and aborting the operation, it gives you the option to try it anyway). However, you can also load the weights and choose to identify the vertices by position. This way TPDC compares all vertex positions from the .wif file to the new skin. If the position matches, then it must be the same vertex, and copies the weight. If a matching vertex cannot be found, the vertex will not be assigned (green). That means there are no materials on your skin, has nothing to do with the number of vertices. Green = unassigned, red = assigned. For more info on colors, check the readme. Number of vertices of current mesh does not match weight information file. Ever thought of it, you may be doing something wrong when you're getting error warnings? All because of the reasons explained above. The .wif feature is just not meant to copy weights between two totally different meshes. To make things clear, 0.2.2 does not solve these issues! If you give any program bad data it will not work. There is no way to detect the correct mesh offset relative to the bones, and for that reason TPDC assumes the root bone is at (0,0,0) and the mesh pivot is also positioned at (0,0,0). The user will have to take care of that. If your mesh pivot is at (0,0,0) but the vertices are still offset, they need to be moved relative to the pivot. This is exactly what you do when you attach your newly modeled skin to the 3DS mesh (you copy the new mesh to the original and thereby inherit the correct position+orientation from the old skin). So in order for that to work, you'll have to export the 3DS file properly. As mentioned, I'll be including these 3DS files of all dinosaurs of the original levels so you can be sure that isn't causing any problems. Maybe I'll even include some MAX template scenes as well. Hope it clears things up a bit. If not, please do ask. So as for a direct answer Draco, you'd either have to re-rig your new skin mesh by hand in TPDC, or try to load the weights 'by position'. But that last method will only work if your skin has the right offset, otherwise no match between vertices will be found and no weights will be copied. And this will only work for the vertices that you haven't touched while editing, so you'll HAVE to assign some (if not most) vertices manually eitherway. Assign by index will not work in this case, simply because you've used an imported 3DS file which changes the number of vertices. Even if the number would be the same, then 3dsmax may have reordered them internally while you've been editing. Remdul, thanks a TON for all the tips I think I can get this to work now! 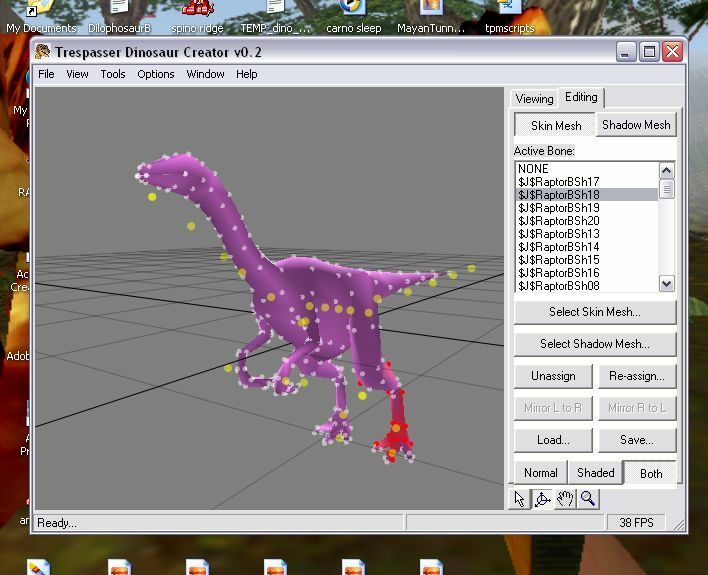 I do have one question; if I export a dino (say, gallimimus) as tpm from Isle and IMPORT that tpm to Max via scripts, then mod it and export it again as tpm, won't it have the same vertex indexes?? Don't have time today but I will impliment this stuff as soon as I get time... thanks again for taking the time to explain it. if I export a dino (say, gallimimus) as tpm from Isle and IMPORT that tpm to Max via scripts, then mod it and export it again as tpm, won't it have the same vertex indexes? Technically, it might, but it cannot be guaranteed. 3dsmax cannot guarantee the vertex order is preserved, or at least not when generating geometry data (i.e. when importing). Andres had a TPM import script up on his page at some point, but I'm not sure about the status of that (whether it still works with the latest TPM version). I don't think that way the vertex indices are guaranteed to be the same with all that importing and exporting, I wouldn't count on it. Well, you can import the galli (or any other dino) as 3DS, try to fix it up as much as possible (mainly weld all vertices and fix the smoothing groups), but you won't be able to use the weights from the original galli if you also edit it. * BTW, it took me less than 30 minutes to rig a single dino for TC Isle, including a few re-exports to fix some vertex warping. Weighting a dino takes only a few minutes really, it's not worth that much trouble. And what happened to all these, in the end? Were they ever finished? Well thank you for your vote of confidence. :p JPDS is actually "coming back online" and we should have a nice juicy update for ya all on our site very soon. As for the new dinos, honestly we need to concentrate on one thing at a time, since our dev team is only about three of four strong. The terrain is our first priority, and anything it is dependent on. I'm currently making mock-models for it. Anyway I gotta go register for college, keep an eye out for that update. Last edited by Draconisaurus on Sun Jun 25, 2006 4:53 am, edited 1 time in total. LOL hey SI, if you want to make more skins let me know I have some cool ones you could use... a new Alberta skin might be nice too, and I have some alberta skins from different JP games on hand. Also did you ever get that music track with the EA music?? things I'd like to get you started on.